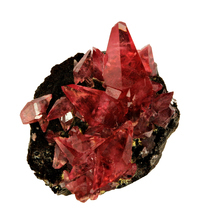 Gorgeous red lustrous gemmy scalenohedral crystals of rhodochrosite to 1.6 cm in length are mostly covering a 3.1 x 2.9 x 2.0 cm matrix. Minor and small cleaving is present on some crystal edges, typical of these. The extent of this is visible in the photos. The color and luster of the crystals is excellent. Ex Lloyd Tate collection. 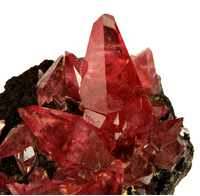 Ref: The Mineralogical Record; 28: 37-62.